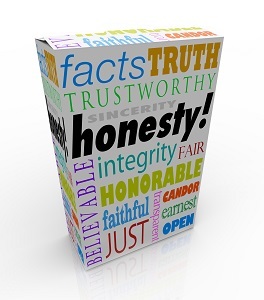 Is honesty one of your family’s top moral values? Honesty rises to the top for many families because it is a cornerstone of intimate relationships. It allows relationships to be deep and loving. However, being honest is quite challenging for most people. Dan Ariely, a professor at Duke University, describes clever experiments to measure dishonesty in his book, The Honest Truth About Dishonesty: How We Lie to Everyone---Especially Ourselves. For example, when given the opportunity to cheat on a test to solve math matrices, the average person reports solving 70% more problems correctly than the control group who couldn’t cheat. Wow! “The first key ingredient is theory of mind or the mind-reading ability. Mind reading is the ability to know that different people have different knowledge about the situation and the ability to differentiate between what I know and what you know. In one study kids were told they’d win a prize if they could guess the numbers on two face-down cards. The researchers then left the room telling the kids not to peek at the cards. Hidden cameras showed that 90% of kids peeked. When the researchers came back in the room and asked kids if they had peeked, what did they say? They also wanted to know if adults could detect which kids were lying. They showed videos where some kids were lying and some were telling the truth. They found that from social workers, child-protection lawyers to parents, adults were poor at detecting who was lying. So what do you do if you catch your kids lying? Your response will depend on the situation. When young children lie it is often obvious. What if the situation involving your children’s lying is more serious? There will probably be consequences directly related to the lie. For example, one mom whose daughter lied to her about skipping school attended school with her daughter for the next few days. As you can guess she was strongly motivated to avoid having her mom in her classes anytime again! The cost of lies is the destruction of trust. When your children lie, they need to find ways to rebuild trust. Having them figure out how they will do this helps them learn how to make amends for their mistakes. Starting off this way instead of immediately blaming Jake created a sense of safety. Jake confessed to taking the money in order to give it to a classmate as payment for not being bullied. They proceeded to have a deep conversation about why Jake made these choices and what other options were available. Although getting good grades is important, is it more important than being honest? Many students think so. While the old fashioned tactic of leaning over to glance at someone else’s paper still works, it’s often replaced by more sophisticated approaches. From using cellphones to smart watches, there are plenty of high tech ways kids use to cheat. Another way some students improve their performance is by taking “study drugs” to increase their focus. These drugs are available either from other students or by getting a prescription from a doctor as explained in the article “Risky Rise of the Good-Grade Pill”. When parents pressure doctors to prescribe these drugs, kids get the unspoken message that cheating is okay. People are very good at justifying their dishonesty. Kids cheating on a test may reason that everyone else is doing it so the only way to get a decent grade is to also cheat a little. Given the prevalence of lying and cheating, is it worth dealing with minor infractions? Yes. Ignoring minor infractions encourages even greater acts of dishonesty. Your children look to you for guidance on acceptable versus unacceptable behavior. By curbing even small acts of dishonesty, you can set a high standard for honesty within your family.